This article deals with the application of Spatial Time-Frequency Distribution (STFD) to the direction finding problem using the Multiple Signal Classification (MUSIC)algorithm. A comparative performance analysis is performed for the method under consideration with respect to that using data covariance matrix when the received array signals are subject to calibration errors in a non-stationary environment. An unified analytical expression of the Direction Of Arrival (DOA) error estimation is derived for both methods. Numerical results show the effect of the parameters intervening in the derived expression on the algorithm performance. It is particularly observed that for low Signal to Noise Ratio (SNR) and high Signal to sensor Perturbation Ratio (SPR) the STFD method gives better performance, while for high SNR and for the same SPR both methods give similar performance. Advances in antennas technology and signal processing have allowed the emergence of the generation of "the so-called" smart antennas. The latter are commonly used for the direction of arrival (DOA) estimation of far field sources from multiple antenna outputs. DOA estimation is currently one of the important issues in next generation wireless communications, namely the space division multiple access (SDMA). The techniques used in DOA estimation depend on the nature of the signals under consideration. When the impinging signals are stationary, conventional methods such as the eigen-subspace decomposition of the covariance data matrix are usually used [1, 2]. These methods lose of their performance for non-stationary signals. Other high resolution techniques like the ones based on the spatial time-frequency distributions (STFD) were introduced to cope with the non-stationary nature of the signals [3–6]. STFD based methods are based on the use of the quadratic time-frequency distributions of the received signals at the array antenna. High resolution DOA estimation consists of applying the eigen-subspace decomposition of the STFD instead of the conventional covariance data matrix. In , performance comparison between the Time-Frequency MUSIC (TF-MUSIC) and the conventional MUSIC, in presence of additive noise, is provided. In , statistical performance analysis in presence of sensor errors without considering the presence of observation noise are conducted for DOA estimation algorithms based on second-order statistics (SOS). In , first-order perturbation analysis of the conventional SOS MUSIC and root-MUSIC algorithms is presented. In this article, our interest is focused on the performance analysis of the conventional MUSIC and the TF-MUSIC algorithms in the presence of both additive noise and sensor errors. These errors can incorporate the effect of imprecisely known sensor location, perturbations in the antenna amplitude and phase patterns that we consider as the calibration errors. A unified analytical expression of the DOA error estimation is derived for both methods. An analysis of the effect of the sensor perturbations on the performance of the considered algorithms is also provided. In this article, boldface symbols are used in lower-case letters for vectors (e.g., a), and in upper-case letters for matrices (e.g., A). The principal symbols and notations used are listed below. δ i,k Kronecker delta function. where S i and φ i (t) are the amplitude and phase of the i th source signal. The amplitude S i is assumed to be a random variable with zero mean and variance σ s i 2 , while the phase φ i (t) is time varying. In order to exploit the STFD given by (13) under an eigen-decomposition form, we use an averaging method which consists of averaging the STFD matrix D y ̃ y ̃ ( t , f ) at (t i , f i ) points over the selected sources and over a number of T o selected tf-points (T o = M - N + 1), where M is the number of snapshots. In Equation (28), the superscript "sos" stands for second-order statistics associated to the covariance matrix based method, and the superscript "tf" stands for time-frequency associated to the STFD based method. It is important to observe from Equation (25) that in absence of additive noise, the STFD based method do not make any improvement compared to the conventional MUSIC. On the other hand, in presence of additive noise, as it is always the case in a real-life situation, the signal to noise ratio (SNR) is improved by a factor N/K for the STFD based method. This improvement would be still better for larger window length. where Λ ̃ = diag [ λ i , i = 1 , . . . , L ] is the matrix of the eigenvalues of P y ̃ y ̃ , and u ̃ i i = 1 L are the corresponding eigenvectors. These definitions and notations being made, and for the sake of simplicity we consider in the sequel only the unified form P y ̃ y ̃ given by Equation (30) to deal with both the covariance and the STFD based methods. where ΔU s and ΔU p represent, respectively, the perturbation of the signal subspace and the orthogonal subspace. Taking into account the notations given in the previous section, the results (41) and (46) are valid for both the conventional and time-frequency MUSIC. In this section, simulation results are given for the STFD and the SOS MUSIC methods. Two received chirp source signals are considered, s1(t) = S1exp[j((w12 - w11)(t2/2) + w11t)] and s2(t) = S2exp[j((w22 - w21)(t2/2) + w21t)] with powers σ s 1 2 = 1 and σ s 2 2 = 4 , and with frequencies varying from w11 = π/6 to w12 = π and from w21 = π to w22 = π/6, respectively. The signals are positioned at angles θ1 = -10° and θ2 = 10° and are received by a uniform linear array of eight sensors spaced by half-wavelength. The signal at the output of the array is disturbed by calibration errors in addition to the additive noise. These perturbations are assumed uncorrelated Gaussian variables with zero mean. In all simulations, we limit our discussion to small calibration errors and consider the signal to perturbation ratio (SPR) for the values 30, 35, and 40 dB. In the STFD based method, a PWVD with rectangular window length of 129 is applied to the sensor output data. The observation period is 1024 snapshots and the results are averaged over 500 independent Monte Carlo trials. DOA estimates θ ̃ 1 and θ ̃ 2 are obtained for each Monte Carlo run by locating the peaks of the spectrum and comparing them to θ1 and θ2, respectively. The variance of the differences Δ θ 1 = θ ̃ 1 - θ 1 and Δ θ 2 = θ ̃ 2 - θ 2 , constitute the simulation results. As for numerical results related to the variance terms in Equations (48) and (49), they are obtained by Monte Carlo method. Figures 1, 2, 3, and 4 show the statistical performance of each method versus the SNR for different values of the SPR. The curves in these figures compare the empirical standard deviation with the theoretical expressions shown by (48) and (49). The results presented in Figures 1 and 3 are obtained using Δθ1, whereas the results presented in Figures 2 and 4 are obtained for Δθ2. As we can see from Figures 1 and 2, the simulation results for the SOS-based method agree closely with the results of the derived analytical expression for SNR ≥ 0 dB. The same observation is made for the STFD-based method from Figures 3 and 4 but for a larger range of SNRs. We can also observe that for the SOS-based method the matching between empirical and theoretical results is lost for very low SNR values (i.e., SNR <0) due to the fact that the first order disturbance analysis is not pertinent in this context. However, for the STFD-based method, the matching between empirical and theoretical results still hold because the local SNR value at the auto-source time-frequency point is relatively large even at SNR = -10 dB. This robustness with respect to noise may be explained by the effect of spreading the noise power over the time-frequency plan and of localizing the source energy in the t-f domain. Moreover, as shown in the above referenced equations, this result is supported by the SNR improvement of a factor equal to the t-f window length N over the SNR associated to SOS based method. SOS-MUSIC: standard deviation versus SNR for the source at -10°. 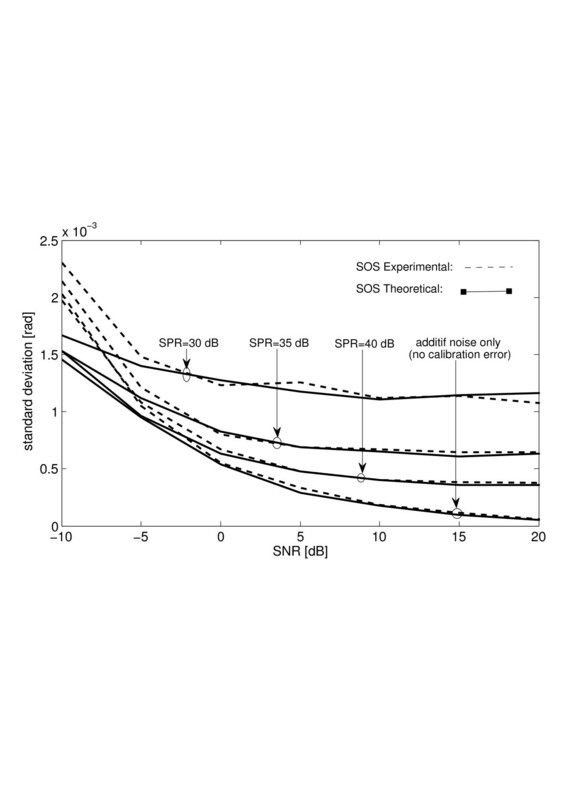 SOS-MUSIC: standard deviation versus SNR for the source at 10°. 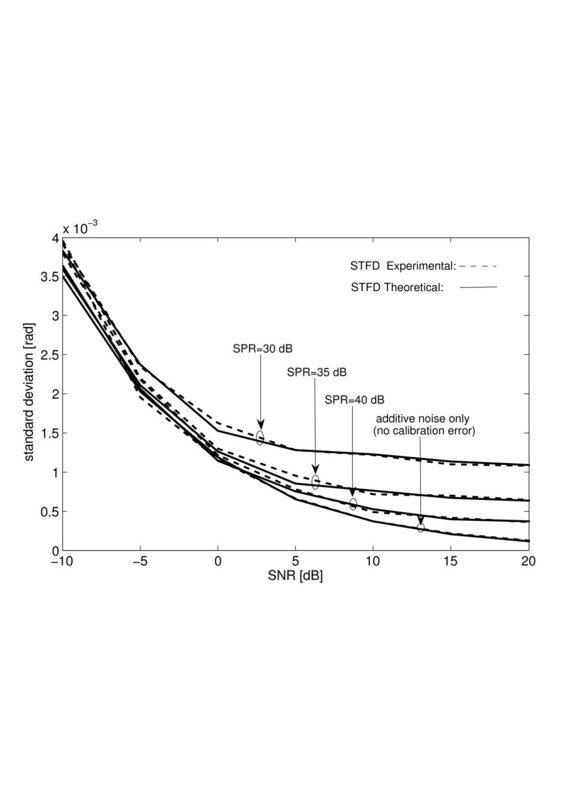 STFD-MUSIC: standard deviation versus SNR for the source at -10°. 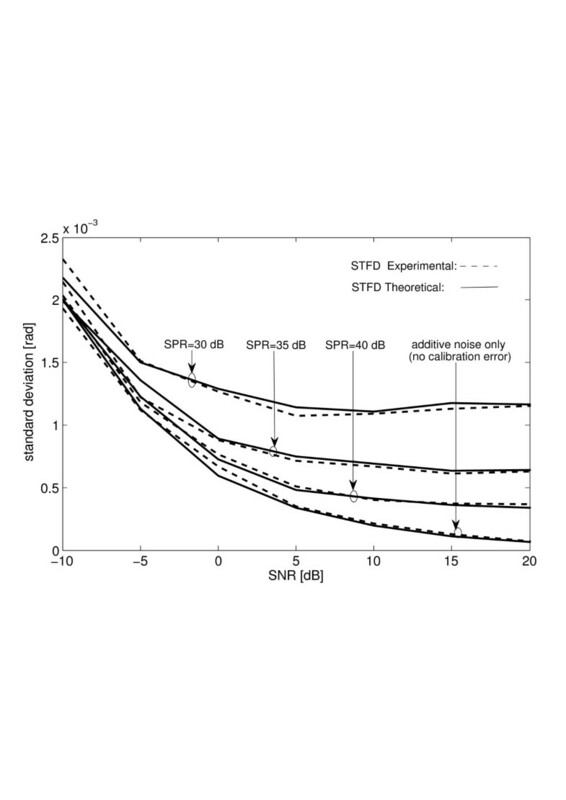 STFD-MUSIC: standard deviation versus SNR for the source at 10°. Next, the conducted performance comparison of the SOS and TF-based methods are carried out with respect to the first DOA, the comparison results with respect to the second one being similar. 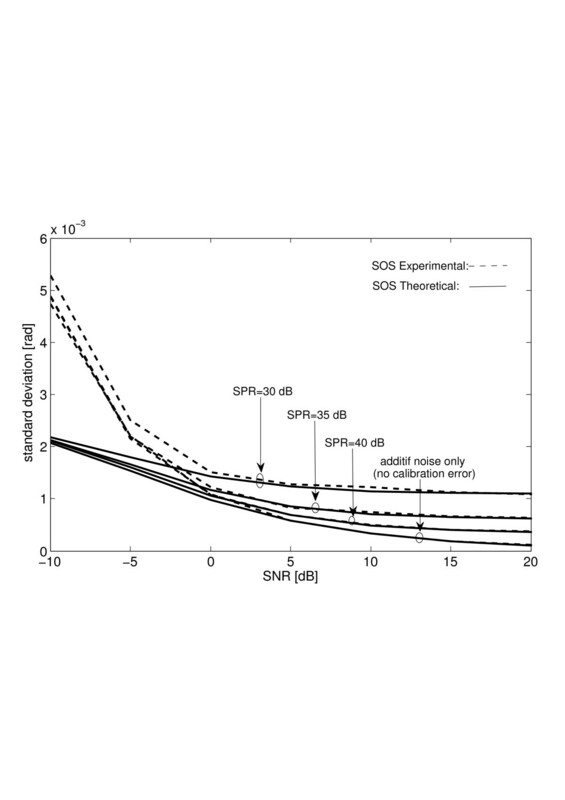 Figure 5 shows no significant difference between the two methods for SNRs ≥ -5 dB and high SPRs values, whereas for lower SNRs (≤ - 5 dB) the STFD-based method significantly outperforms the SOS-based one. This difference, as shown in Figures 6 and 7, is further affected by the number of sensors which is a parameter of resolution and thus of performance. It is clear from these figures that more the number of sensors is large, better is the performance of the algorithms. 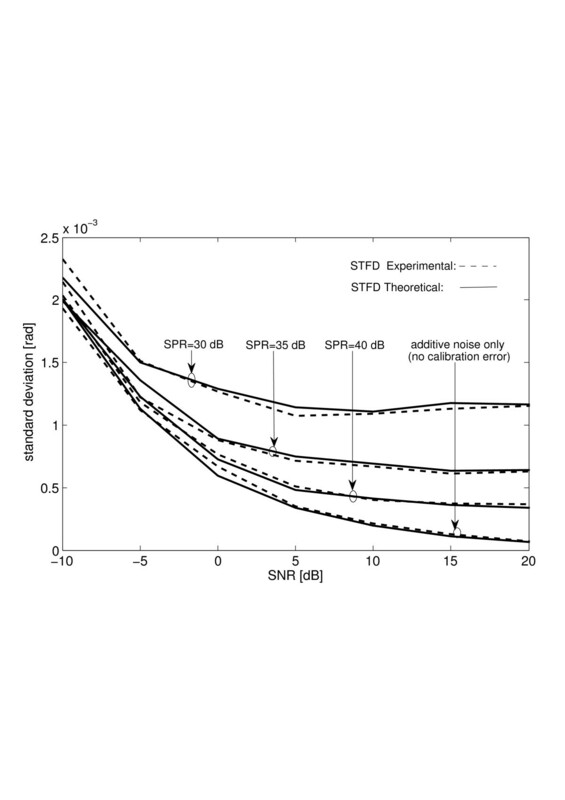 Figure 6 shows the improvement carried out by the STFD-based method in presence of high additive noise (SNR = -10 dB). As expected from data model (4) and Equation (28), it is observed in this figure that the presence of small calibration errors (SPR = 30 dB) have no significant effect on both methods and all occurs as if there were only the presence of the additive noise. However, as shown in Figure 7, the presence of weak noise with the same calibration error value as in the previous figure, produce a significant performance degradation and the two methods become equivalent. 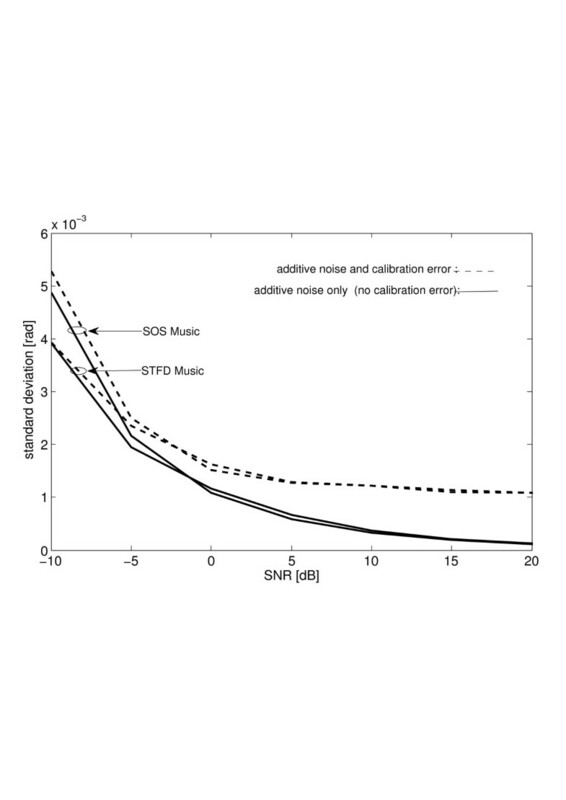 SOS and STFD-MUSIC: standard deviation versus SNR for small calibration errors (SPR = 30 dB). 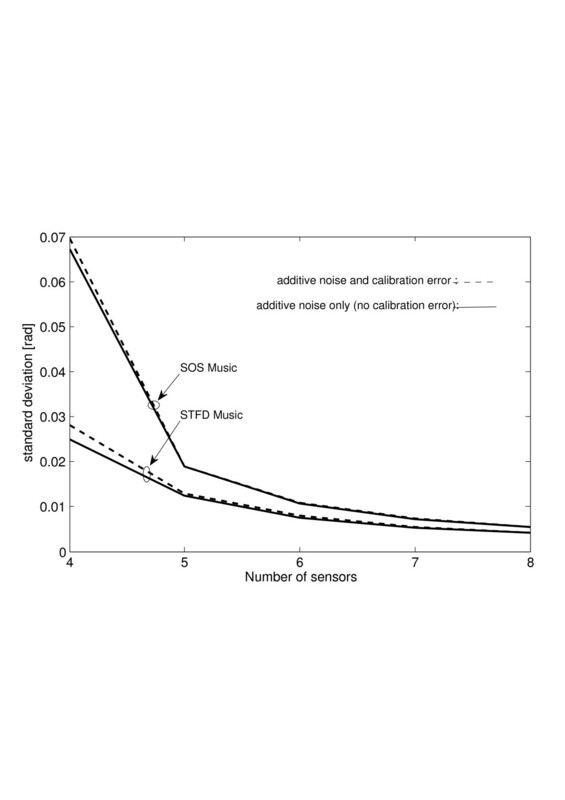 SOS and STFD-MUSIC: standard deviation versus the number of sensors for low SNR (= -10 dB) and small calibration errors (SPR = 30 dB). 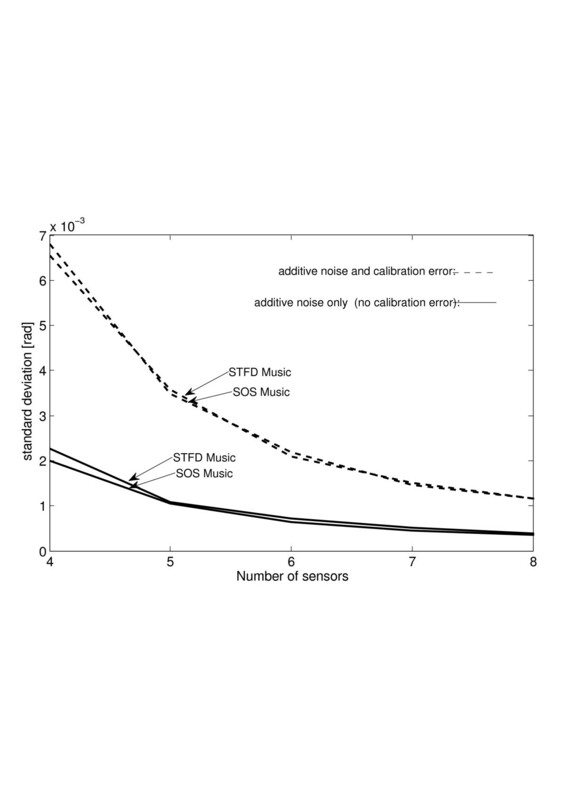 SOS and STFD-MUSIC: standard deviation versus number of sensors for high SNR (= 10 dB) and small calibration errors (SPR = 30 dB). The STFD-based direction finding and covariance matrix-based methods have been considered and a unified analytical expression of the DOA error estimation have been derived for both methods. It is shown that in presence of calibration errors and large additive noise the STFD-based method has better performance than the SOS-based method, and that in presence of weak noise both methods are equivalent in their performance. However, even for small sensor perturbations, degradation in performance remains significant because of the multiplicative character of the perturbation with the signal. Through the results obtained in this article, it clearly appears that the TF-MUSIC algorithm plays an important role in the performance improvement, however the implementation of this algorithm may be useless if the sensors are already at the outset too badly calibrated. the superscripts (1) and (2) correspond to the first and the second-order derivatives of a(θ) with respect to θ, respectively.